Home > Hair Style > Ranked among the best hair salons in Cleveland – and in the United States! 23 Mar Ranked among the best hair salons in Cleveland – and in the United States! 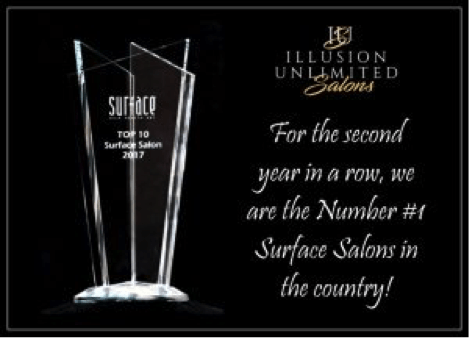 For the second year in a row, Illusion Unlimited’s Cleveland hair salons received a top industry award, being named first in the nation for 2017 in the sale of Surface Hair products. This now makes it six years in a row that we have been recognized by some of the most highly respected names in the beauty industry – not only as one of the best hair salons in Cleveland, but also as one of the top salons in the United Sates! We are very proud and excited about receiving these honors and are grateful to our many loyal clients who made it possible as well as to our exceptional team, whose professionalism and dedication are at the heart of what we do. The awards belong to everyone at Illusion Unlimited– from the person who greets you when you walk in the front door of our hair salons in Cleveland, Ohio to the stylist who gives you the best cut you’ve ever had! We aren’t satisfied with knowing that you’ll walk out of our Broadview Heights and Parma hair salons or our Strongsville, Ohio location looking amazing. We want you to leave with the confidence that comes from knowing you have the tools as well as the amazing haircut that will allow you to look – and feel – fabulous every day. We earned our reputation as the best hair salon in Cleveland by going the extra distance, by showing you how to put all the various aspects of your look together. Yes, a great cut – like the one you’ll get from Kelly at our Parma location, Rebecca at our salon in Broadview Heights or Jeanette at our Strongsville hair salon – is important but there are other factors, too. We’ll teach you the styling techniques that will allow you to recreate the look you leave the salon with. Hair color – whether it’s your own gorgeous natural shade or the color you’ve dreamed of carefully applied by one of the color experts at our three hair salons in Cleveland, Ohio – and your fashion sense are all part of the picture. When it comes to color, we use special lighting that floods our salons with what appears to be natural daylight. In other words, you won’t have to step outside, or invite that new guy on a picnic when you want your hair color to shine. We also use the latest in color consultation techniques so that you can get a really good idea of how the various shades you’re considering will look on you – rather than on a model in the pages of a magazine. And, when you find a color that you absolutely adore, we’ll record the unique blend with a digital process based on weights instead of traditional liquid measurements to ensure consistent results you can count on. It’s by understanding you – not just your hair – that we are able to create personalized styles that are stylishly up-to-date and a holistic part of the way you present yourself to the world. We think that’s what you deserve! And we think that’s what has earned us a reputation as one of the best hair salons in Cleveland – year after year.